If Texas lacks one thing, food is not it. From barbecue joints to bakeries, Texas has it all and a lot of it is right in Dallas. I severely overestimated the amount of food my stomach needs so I didn't get to nearly as many restaurants as I would have liked but I have a few to share with you that were pretty spectacular. Celebration is a farm to table restaurant located in Bluffview that serves old school home style cooking. Their menu consists of everything from Pot Roast to Meatloaf and Fried Chicken. The experience begins with a large basket of baked goods like cornbread, muffins and French bread. Everyone chooses an entree and sides for the table to share. It's just like Sunday night dinners when you were a kid. Everything tastes fantastic and the service is phenomenal. The restaurant is enormous too. I had the Fried Chicken (because, when in Texas...) with the Chicken Tortilla Soup as my appetizer as well as the Field Green Salad with Red Anjou Pears, Bleu Cheese, Candied Pecans and Lemon Garlic Vinaigrette. For the table, we ordered Mashed Potatoes and to finish it off I ordered a slice of Pumpkin Pecan Pie. I just about died. 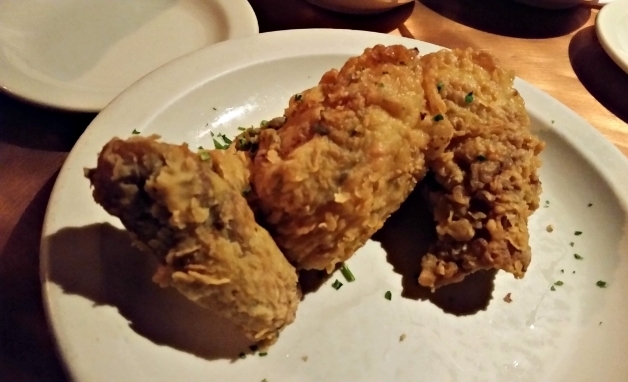 The Fried Chicken wasn't greasy, it was tender, juicy and flavorful. The salad was nice and refreshing, the soup addicting (I could have had five more bowls) and the potatoes perfection. The pie was really the star of the show: creamy, decadent and sweet. I don't think I could have ended a meal any better. The lighting was pretty dark so please excuse the poor photo quality. Ozona is a casual restaurant in Northeast Dallas on Greenville Avenue, a very popular avenue in the city. I talked a bit about Lower Greenville in my previous post outlining neighborhoods you have to visit and this restaurant is just north of it. I went to Ozona with my cousins just a few nights before I left and it couldn't have been a more perfect spot. They have a large outdoor patio with fireplaces. It's cozy and comfortable, perfect for dinner with friends, a first date or even a night alone. They serve typical American food as well as Mexican food. I ordered the Cheeseburger because I was in that kind of mood but their Mexican platters looked incredible. I also swapped regular fries for sweet potato, amazing. Food trucks are something I'm kind of obsessed with right now. Maybe it's because they're fairly new to Chicago (legally, at least) or maybe it's because I never really gave them much attention before but now I want to try food trucks wherever I go. Klyde Warren Park in downtown Dallas has food trucks every day. I happened to be there the day Ruthie's Rolling Cafe was in business and ordered their Plain Jane, the classic grilled cheese sandwich you had when you were a kid. It was exactly what I needed. Something simple, delicious and familiar. The afternoon I stopped by Ruthie's, it was a little warm and I wasn't particularly feeling too hungry but next time I'm in Dallas, I'd like to stop by their truck for one of the larger sandwiches like the Italian Hippy but I also really want to try the Extra Cheesy Classic. Finally, we have Village Burger Bar. I never planned to go to this spot. It wasn't on my list of places to try. I was at a coffee shop in Cityplace/West Village and because of meetings wasn't going to make it to Klyde Warren Park for the food trucks before they left. So I pushed the food trucks to another day and looked around for a burger place. I was craving a cheeseburger and this place popped up as closest. It must have been fate because I swear this is one of the best burgers I've ever had. 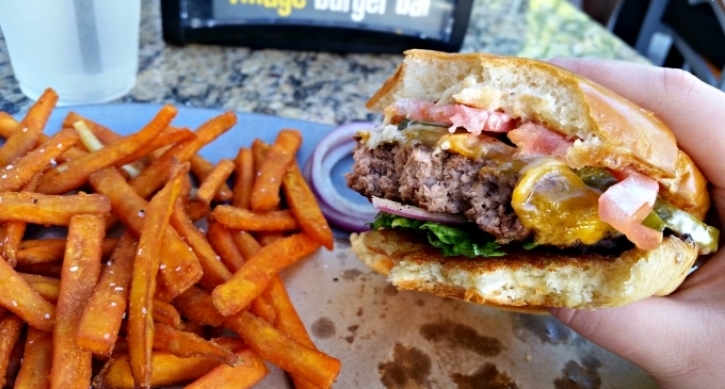 I ordered the Champagne and Cheddar Burger with Sweet Potato Fries. It was juicy, flavorful and way better than I expected. 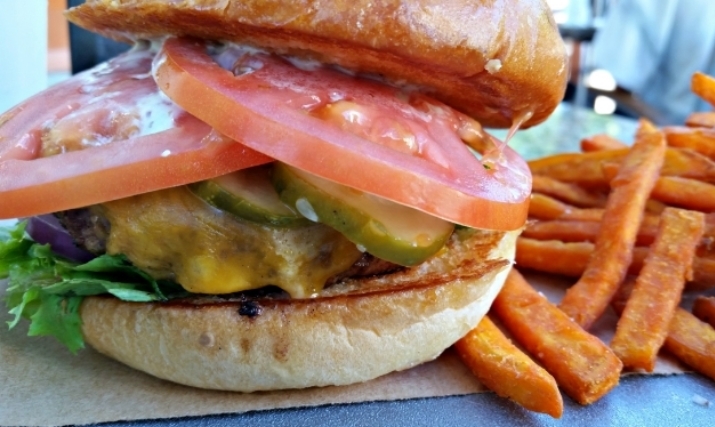 It's a classic cheddar cheeseburger with a champagne mustard sauce that really makes this exceptional. All I can say is that if you're ever in Dallas, Allen or Plano you must stop here.